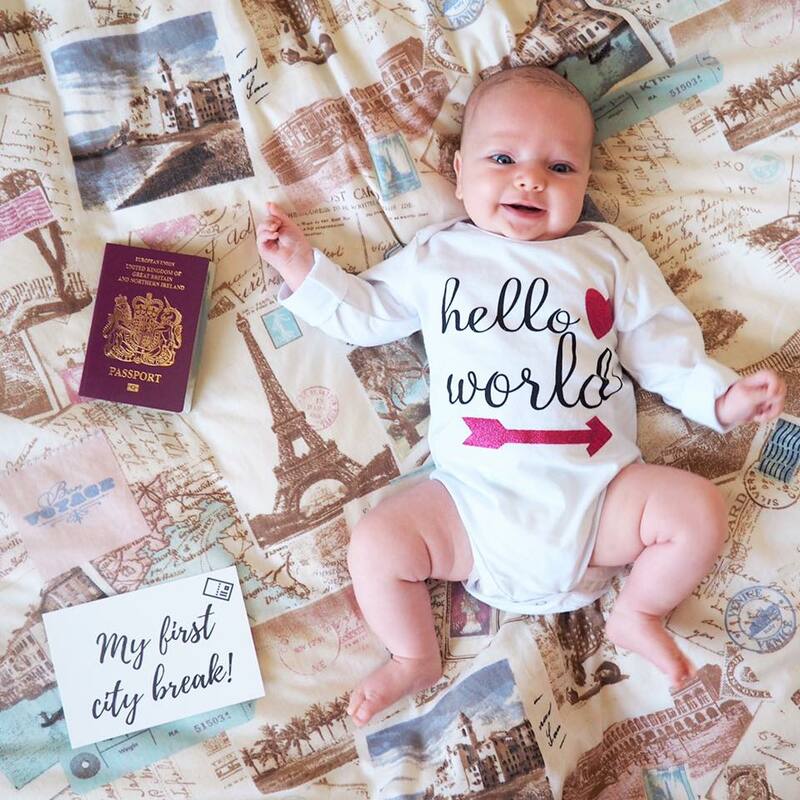 Having had some serious travel withdrawals due to not being away since September, I was desperate for a break as soon as our little adventurer arrived. Plus I think it was well deserved after, ya know, pushing a tiny human out! For our very first trip with our little adventurer we wanted somewhere that wasn’t too far away which was easy to get to, and so Paris seemed like the perfect choice. Despite it being so close to London we hadn’t been in 12 years and it’s somewhere I had been wanting to return to for such a long time. 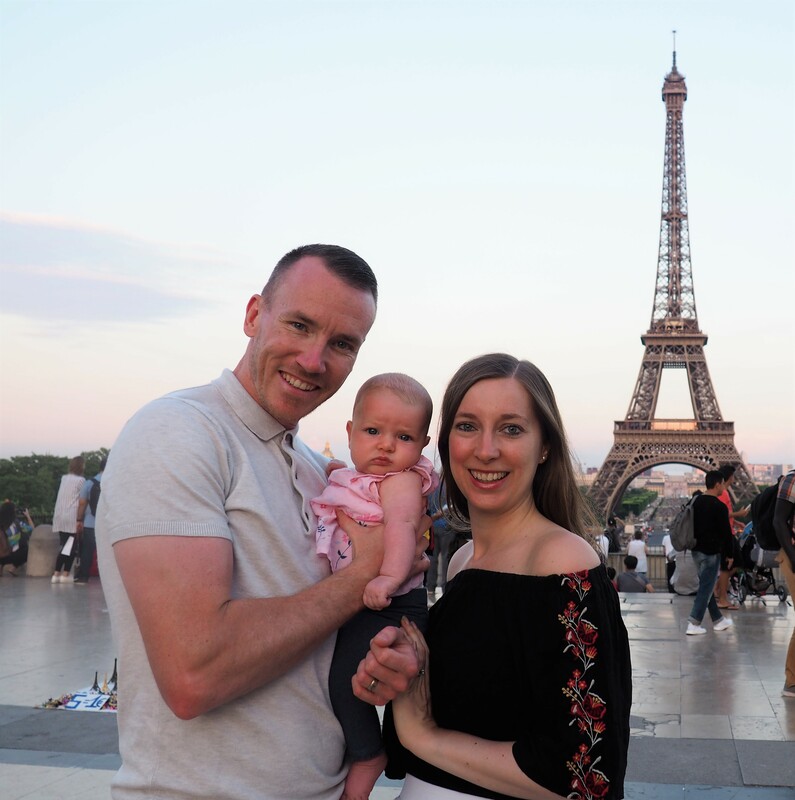 The bonus of taking the Eurostar over flying sealed the deal, so we took the plunge and booked our first trip for when Evie was just 9 weeks old. So many people had told us this is the easiest time to travel with a baby, when they’re tiny and can’t walk around yet and don’t do much apart from eat and sleep, and they were totally right. But a lot of people had also said that Paris is not a good place to go with a baby and hopefully this post will prove that I don’t agree with these people at all! Paris is a great idea with a baby! 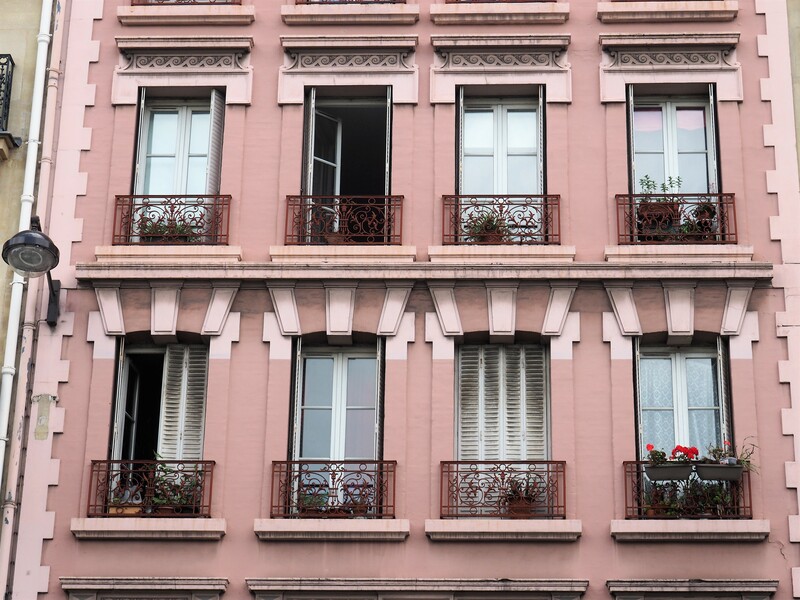 Accommodation in Paris is notoriously expensive and rooms notoriously tiny so we decided to opt for an Airbnb apartment in the centre of the city. Not only was this a cheaper option but it also meant we had a lovely relaxed cosy feel to make Evie feel at home, a bigger room to store the hundreds of nappies we’d packed as well as room for a cot, plus a kitchen which meant we could make food or get a take away which was sometimes more convenient than eating out (and also great if you’re bottle feeding and need to sterilise or heat bottles up). 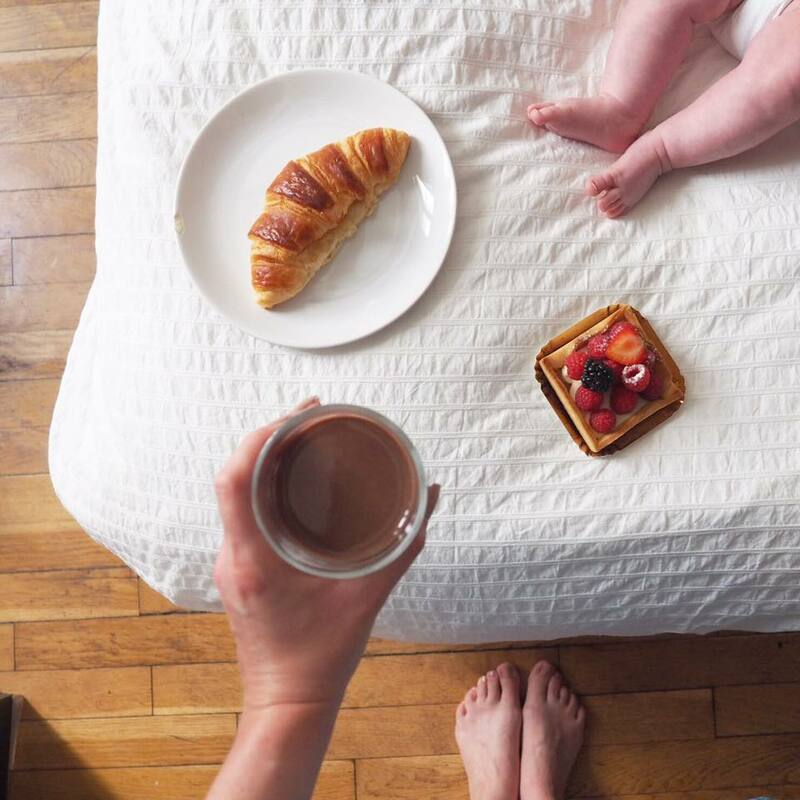 Our mornings were perfect – I would feed Evie her breakfast while Alex would head out to get ours from one of the many delicious smelling patisseries nearby the apartment. You can’t beat fresh French croissants and pastries for breakfast every day! This is the part that everybody had warned us would be difficult as the narrow barriers and many steps of the city’s metro along with Paris’s narrow cobbled streets don’t make it an easy task for mamas with buggies. But I’d done my research and knew what to expect so we went prepared with our Babyzen Yoyo, a tiny little pram that can fold up to the size of cabin baggage on a plane and has a handy strap to carry over your shoulder like a bag. This isn’t a sponsored post for Babyzen – promise! 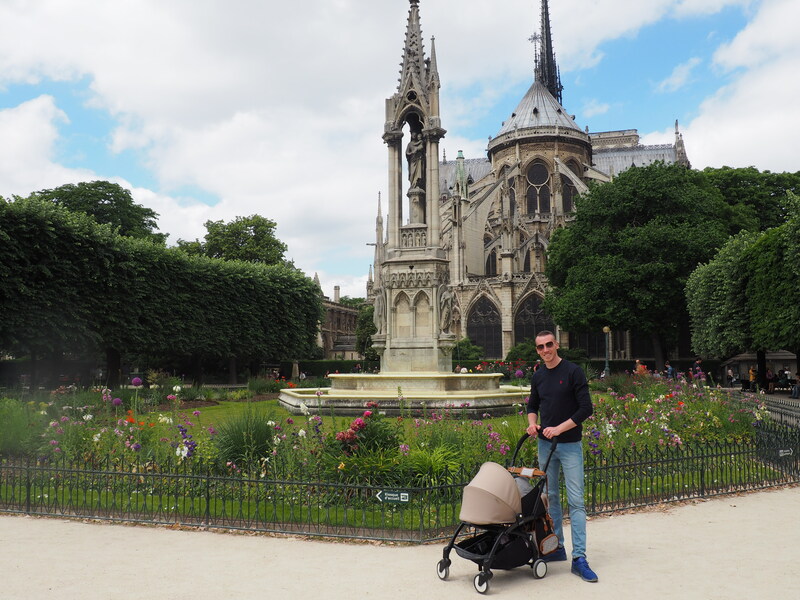 I just really don’t think there is a better way to explore Paris with a baby and this pram was an absolute god send. We could zip in and out of the small roads and alleyways and the pram could easily be wheeled into restaurants which we wouldn’t have been able to do if we’d had a big bulky pram. It seemed that the Yoyo is a hugely popular pram in Paris as we saw them everywhere we went. We saw so many in fact that Alex got bored of me keep pointing them out it happened so often! We found the easiest way to get around the city was to use the buses which are very regular and cheap and there was always space for a pram. On the occasions where it was easier to take the metro we used our baby carrier which again was really easy and convenient. 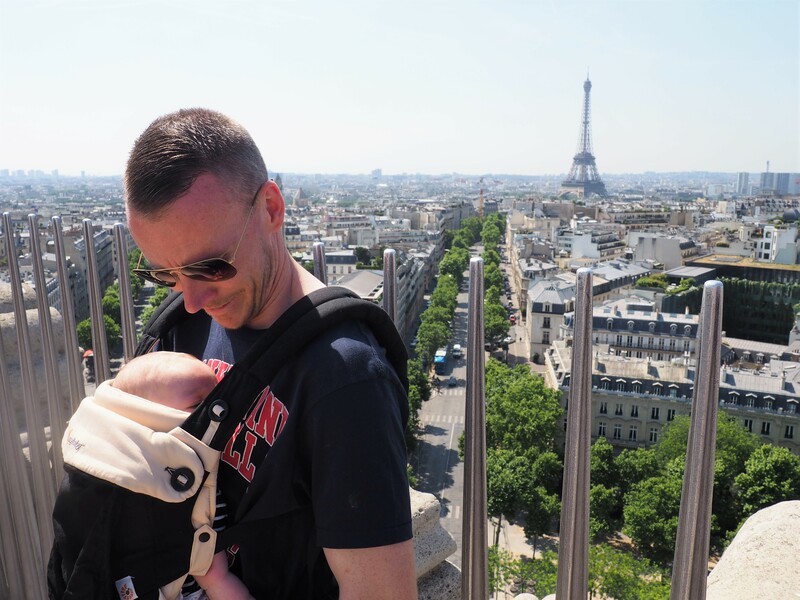 We even climbed the 284 steps to the top of the Arc du Triomphe with Evie in her carrier for some spectacular panoramic views over the city. Well I say we but what I really mean is Alex carried Evie in her carrier while I encouraged him from behind! At only 9 weeks old, Evie didn’t exactly have a lot on her itinerary so we took our time and enjoyed wandering around the city at a slower pace than we’re used to. 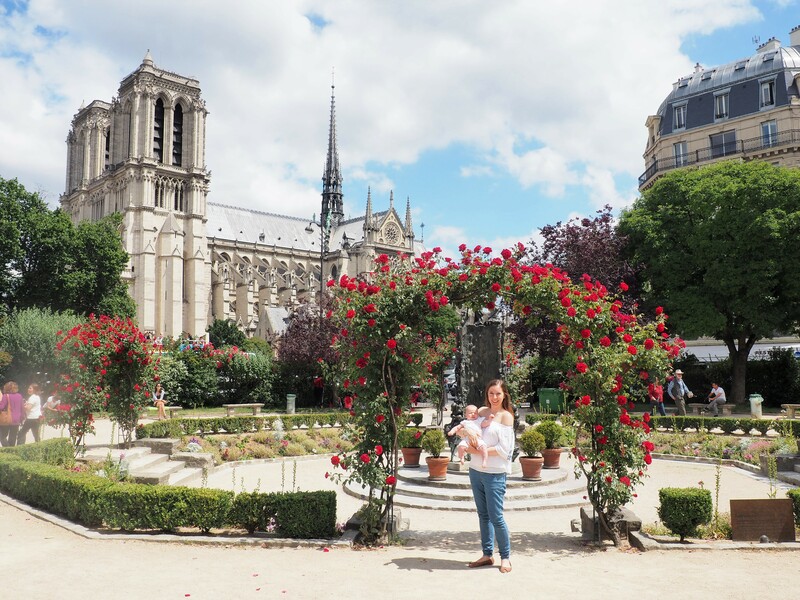 There are plenty of free sights such as museums, parks, and the Notre Dame and Sacre Coeur cathedrals. 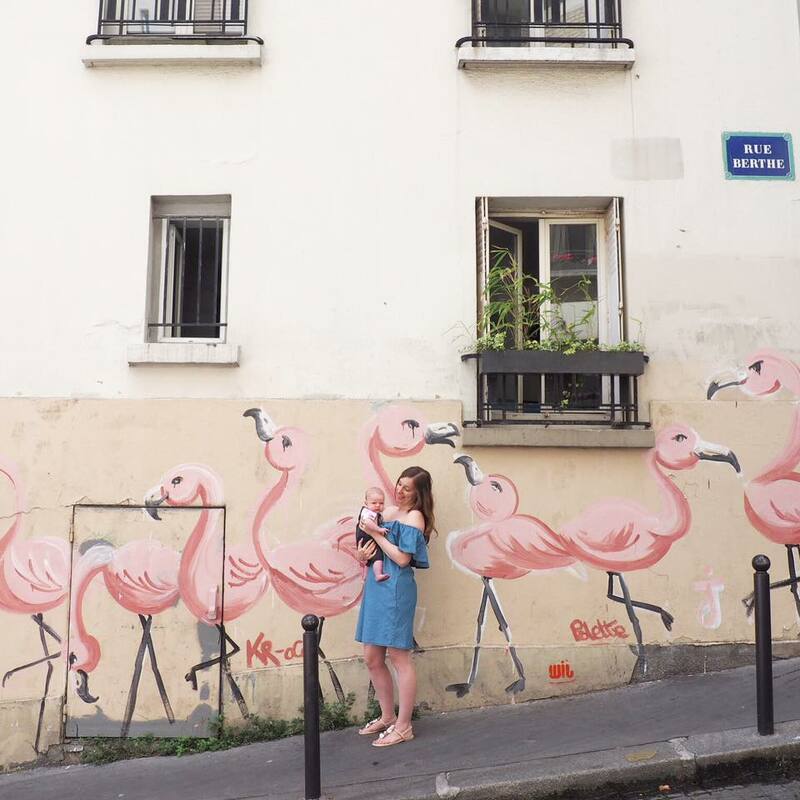 But Paris has so many lovely districts that simply strolling around the streets in places like quirky Montmartre and pretty Saint Germaine was the perfect way to explore. One of the things I love most about Paris is how many parks and green spaces there are dotted around the city. We had blissful weather during our few days there in May which made a park the perfect place to wander around and stop for a picnic. We would grab some baguettes and eclairs, find a nice secluded spot and eat our French style picnic. It was also a lovely relaxing place to feed and change Evie as she loves laying on the grass and having a kick about. The Tullieries Gardens next to the Louvre are especially lovely. Although you can’t actually sit on the grass in this park, there are chairs dotted about everywhere around the pretty grassy areas and fountains. Top find with a baby: While we were wandering around the Tullieries Gardens we stumbled across Carrousel du Louvre, a hidden shopping centre underneath the Louvre. It was perfect timing as we needed somewhere to cool off from the sweltering midday heat and Evie needed changing. Despite hating going to McDonald’s abroad, the one here was actually the perfect find as they had several reclining chairs which I could comfortably feed Evie in. I would have liked to take one home but they were obviously attached to the floor for this reason! Lots of stops for this on our travels now! Of course a trip to Paris can’t miss out the infamous Eiffel Tower. We’d been up to the top on previous visits and as we’d already seen a city viewpoint from the Arc du Triomphe, we didn’t feel the need to go up the Tower again. Plus if you’re at the top of the Eiffel Tower then you can’t actually see it which takes away all the magic! 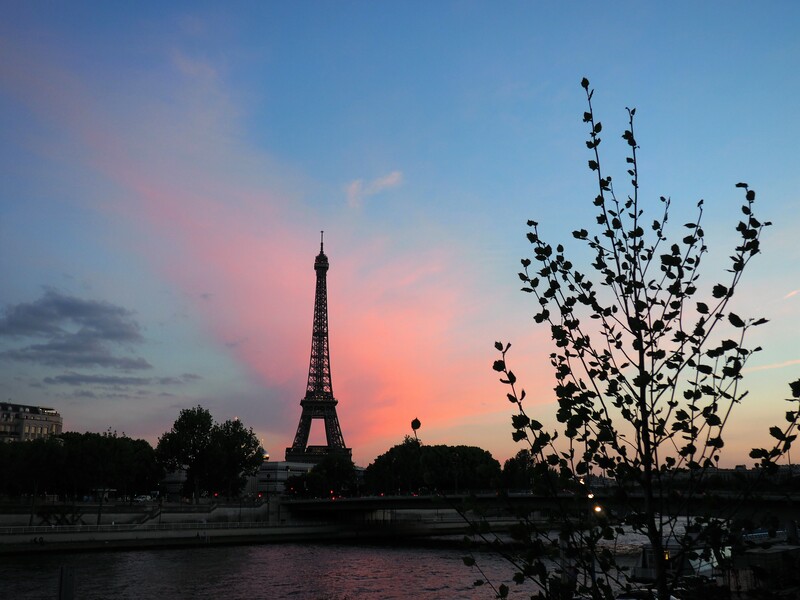 There are fantastic spots all over the city to watch as the sun sets behind the Eiffel Tower, my favourites being from the Pont Alexandre III Bridge, Place du Trocadero or a quiet and secluded side street. 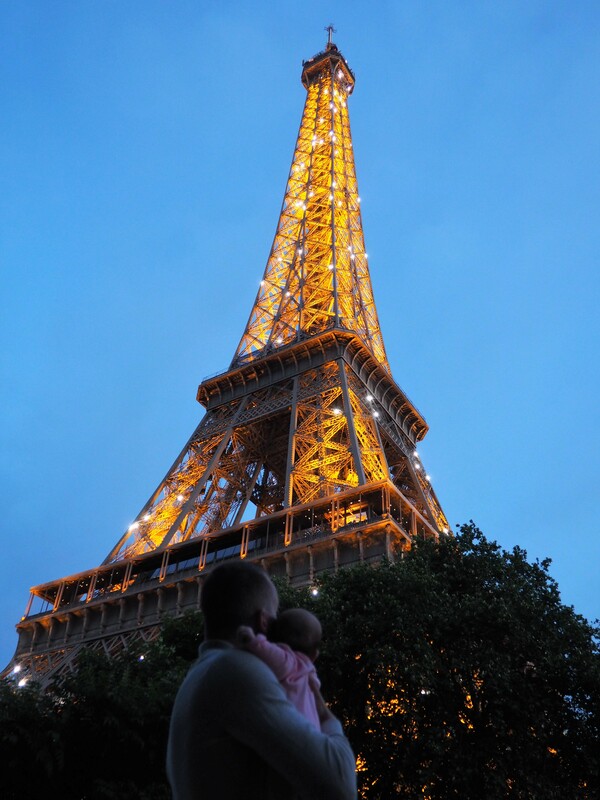 My very favourite moment of the whole trip was when Evie looked up and watched with wide eyed wonder as the Eiffel Tower lit up and started glittering at night. Usually, as soon as I’ve booked a trip, the first thing I research are the best places to eat but this time we kind of had to fit in around a baby’s schedule. As soon as she fell off to sleep in her pram we would dash into a restaurant for some food! Many of the restaurants in Paris have tables that sit extremely close together which makes it quite difficult to fit a pram (even one as small as ours) in anywhere. This meant that it was easier to have an early or late dinner to avoid the crowds. She also has this annoying habit of suddenly being hungry the second I seem to get my own food – pretty sure I’m not the only one whose baby has this habit right?! We would find a quiet restaurant with a secluded table at the back (the front tends to be fairly smoky) where I could breastfeed her and not a single person batted an eyelid. All of the waiting staff were so friendly, helping us find a suitable table and asking lots of questions about Evie. Although it’s nice eating out in restaurants when travelling, we also enjoyed lots of picnics as well as taking food back to our apartment for a cosy meal. 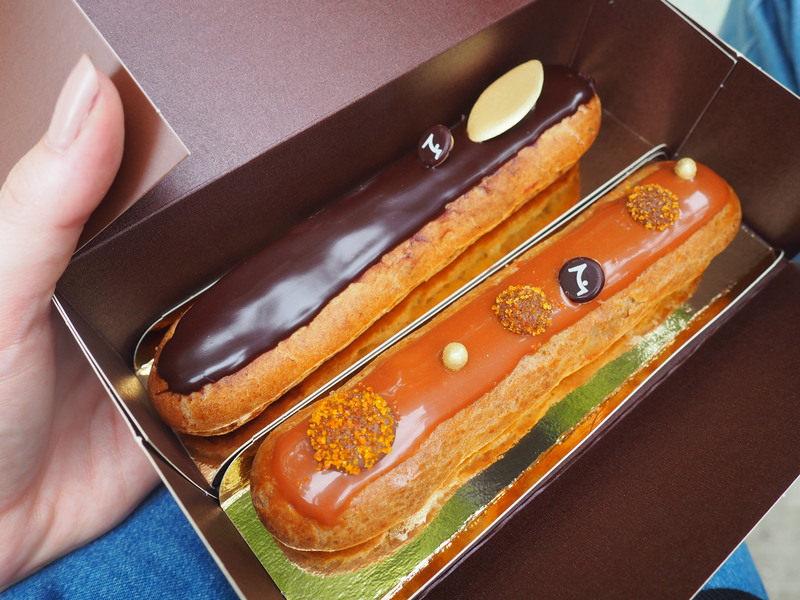 And somehow a couple of eclairs always seemed to work their way back to the apartment with us! This was our first trip with our little one and, while I know every trip will be different as she grows, I have to say that it was a whole lot easier than I was expecting it to be. Of course I was a little nervous about going away with such a young baby but, aside from a slight puking incident at the Eurostar terminal, everything was smooth sailing. We still visited the main sights and parts of the city we wanted to see, we found it super easy to get around using the public transport and my Instagram husband still took all the photos I told asked him to. The only real difference from our travels pre-baby was the amount of things we had to pack (how can such a small person need so much stuff?!). Evie actually seemed to get on better away than she does at home. She slept for much longer at night, she was happier and more relaxed during the day, and she got lots more stimulation than normal by being out and about so much. So many people had said how unfriendly Paris is for babies and children but we found it to be the complete opposite. If you’re prepared and don’t go with a huge buggy, expecting to have romantic meals for three in the fanciest restaurants, then you will be absolutely fine. No one cared about me breastfeeding in public and all the Parisians cooed over Evie wherever we went. It was the perfect destination for our first trip with our little adventurer. Awwwwwnn one of my favorite posts so far! So many amazing photos. I loved your insights, I was really curious to know how it went in Paris with Evie. 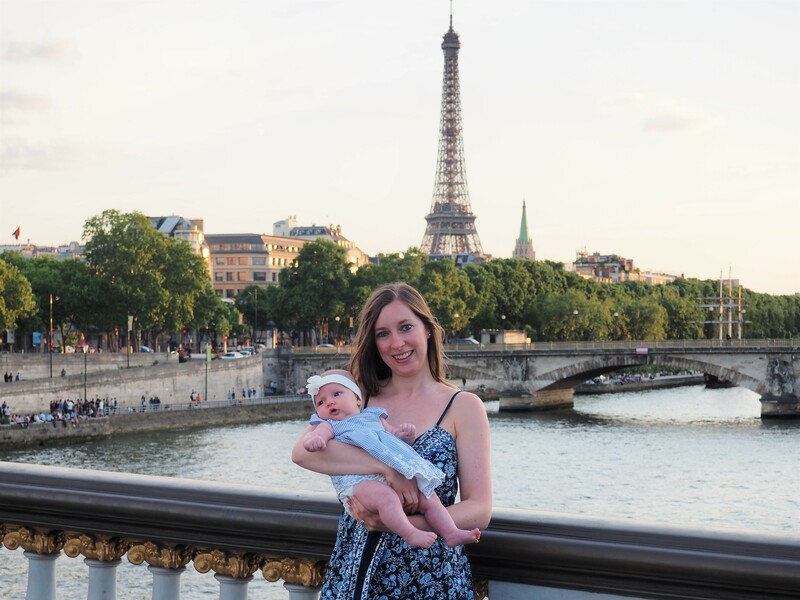 I always thought Paris is a complicated city to travel with a baby, but you proved me wrong! I’m really glad you guys had a wonderful time!!! it` s a breathtaking to watch your piccs. Nice photography skills. Love it! Same! We were there at the end of May too when the weather was absolutely perfect. Hope you enjoyed it as much as we did! What a great trip! We just took our 4 month old on his first trip. We chose somewhere that was a two hour drive away and were only away for two days. I think it was a great starter trip to go longer and further in the future. I would love to go to Paris one day! I’m blogging our adventures at letstravelbaby.blog. I’m going to follow you to keep up with your travels! I hope Paris was the first of many great vacations for you. Aw, so glad your first trip was such a positive experience! You obviously have a little adventurer on your hands 🙂 Reading your post reminded me how much I love Paris.